Have damaged carpet that needs repairs and a thorough cleaning? Rocky Mountain Carpet Cleaning is ready to get to work! We offer repairs, cleaning, stretching and water restoration for carpeting, as well as upholstery cleaning. Let us provide you with a quote on service and see why we’re trusted by home and business owners throughout Norman, OK. Dirty or damaged carpeting can bring down the entire atmosphere of a room. Rips and holes can give it a bedraggled appearance; stains make it look dirty; embedded odors can foul up the space; and wrinkles could be a trip hazard waiting to happen! 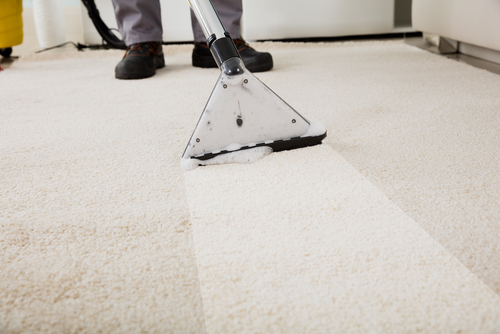 Don’t let your carpet be an eyesore in your home or business—instead, contact Rocky Mountain Carpet Cleaning in Norman, OK! We’re in the business of beautifying your carpets, whether they just need a deep clean or there’s damaged to be repaired. Our mission is to breathe new life into your old carpeting, to help it look, feel and smell like new. The foundation of our carpet cleaning service in Norman, OK is built on a straightforward approach to customer satisfaction. We take the time to fully assess your carpets, to provide recommendations and estimates for cleaning and repair services. Then, we get to work diligently, working hard to alleviate specific problems with your carpets. Whether we’re extracting water, stains or smells, or we’re patching holes and stretching out wrinkles, rest assured we’re putting in the effort required for a job well done. If you’re tired of looking at carpet that’s worn-out and worn-down, give us a call and see why our customers are always satisfied! Dirt and grime can build up over time in those hard to reach cracks and crevices on your tile floor. Save time and elbow grease! Have the experts at Rocky Mountain Carpet Cleaning treat, scrub, and clean your tile floors. We offer free consultations and will gladly measure and assess the needs of your tile floor. We take pride in restoring the beauty of your grout and tile floors! Owner Tony Remillard has over 18 years of carpet cleaning experience and takes pride in delivering honest, quality services to customers. We specialize in carpet cleaning and care for churches, daycare centers and other high traffic areas. Our business is owner-operated and locally-owned, proudly serving customers throughout Norman, OK and other local areas. Talk to us about free estimates on any of our carpet or upholstery cleaning services. We’ll provide you with fair, honest, upfront pricing. Military and senior citizen discounts are available—just ask Tony! Say goodbye to rips, tears, wrinkles and stains in your carpet! Give Rocky Mountain Carpet Cleaning a call and enjoy fresh, clean, smooth carpet once again. Contact us today.